My goal originally, was to improve the way DeXRAYextracted files from Symantec Endpoint Protection (SEP) vbn quarantine files. I decided to dig a little deeper into the vbn format because it is not documented well. What I ended up finding out is that there is a lot of information contained inside vbn files. All vbn files are not created equal. Some contain the quarantined files, while others do not. It all depends on where they are in the quarantine folder structure. The vbn file structure has undergone two revisions, from what I can tell. Version 1 of the format was used up to SEP 11. Version 2 is used in SEP 12 and 14. I would like to give a special thank you to @Hexacorn for getting me some older samples to work with. The file format for version 1 can be found here. Version 2 here. There is still quit a bit that is unknown. If you find any mistakes or know what some of the structures are, please let me know and I will update them. Folder structure makes a difference in what is contained in the vbn file. SEP quarantine files are located in C:\ProgramData\Symantec\Symantec Endpoint Protection\CurrentVersion\Data\Quarantine. In the quarantine folder, there is a vbn file and a folder with the same name as the vbn file. 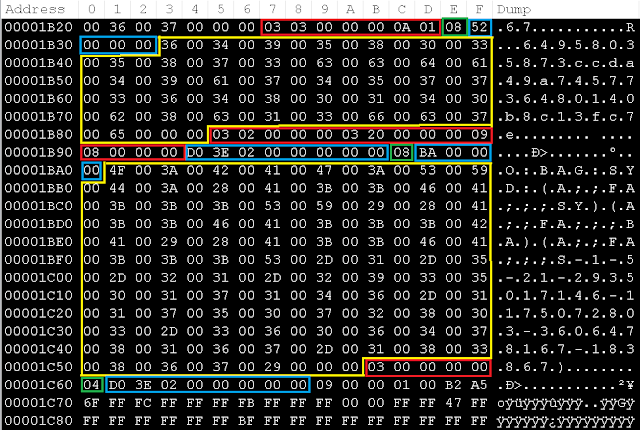 The vbn files and folders get their name from the Vbin Session ID/Record ID in hex format. I have not dug into these vbn files too much yet. If we search for Vbin Session ID/Record ID, depending on version, we come across a series of values that start with 01 07 03. The first one, in green, is our folder name. The second one, in blue, is the name of the vbn file in the folder. This is the vbn that will contain the quarantined file. The vbn files that contain the quarantined file get their name from the unix 32-bit time value (0x560 in v1, 0x7D0 in v2). The information on how to decipher what the various fields mean can be found here. There was too much information to put into this article. Finding and decrypting the quarantined file in version1 is fairly straight forward. Grab the first four bytes from the beginning of the file. It is in little endian. In this example, the hex value translates to E5C. This is the offset to the quarantined file. If we go to this offset, we will fined our quarantined file XORed with 5A. Version 2 is a little trickier. We start off the same way, by grabbing the first four bytes of the file. Again, little endian. Instead of finding the quarantined file, we find the Quarantine File Meda (QFM) Header XORed with 5A. Once the XOR is removed, we can see some values in the QFM header. At offset 0x1298 is the size of the QFM Header. 0x12A0 is the QFM size and 0x12B8 is the total size of the QFM and the QFM Header. Following the quarantine file size will either be 0x08 or 0x09. If it is 0x09, we have arrived at the quarantined file. If it is 0x08, the following optional section is present. The quarantine file is broken up into chunks. The size of the chunks can be figured out by looking at the chunk dividers. The chunk dividers start with 0x09. The next four bytes after are the size of the chunk. The chunk itself is XORed with A5. Continue to the next chunk divider, get the size and wash, rinse, repeat. If there is anything you would like me to expand upon or explain better, let me know and I will add it.